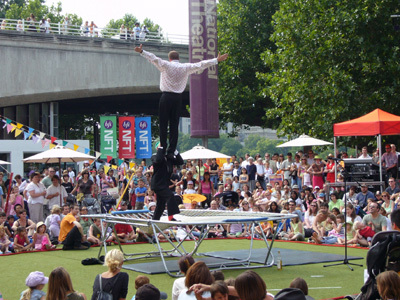 This two man trampoline act is well established both here and abroad and over the years it has appeared in many areas of entertainment, including cabaret, clubs, circus, panto and TV. Ross is the comedy man of few words, but his visual appearance and antics quickly make him a favourite with the audience. His obvious expertise gives him the ability to turn difficult stunts into top class comedy. 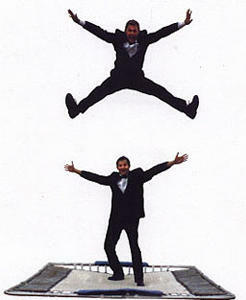 Matt is the straight man who combines hilarious comedy chat with spectacular stunts. Both performers compliment each other in an unforgettable performance which will delight audiences of all ages. Thanks for a really good show, I look forward to working together again in the not too distant future!